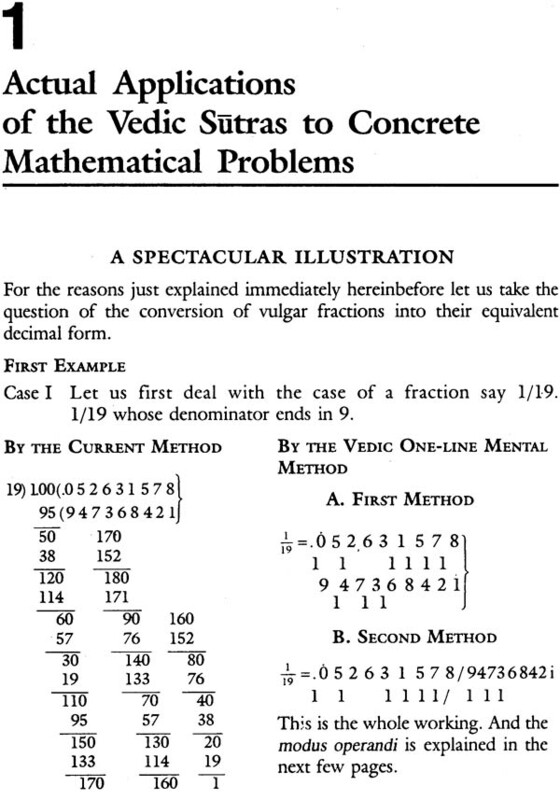 Vedic Mathematics or 'Sixteen Simple Mathematical Formulae from the Vedas' was written by His Holiness Jagadguru Sankaracarya Sri Bharati Krsna Tirthaji Maharaja of Covar- dhana Matha, Puri. 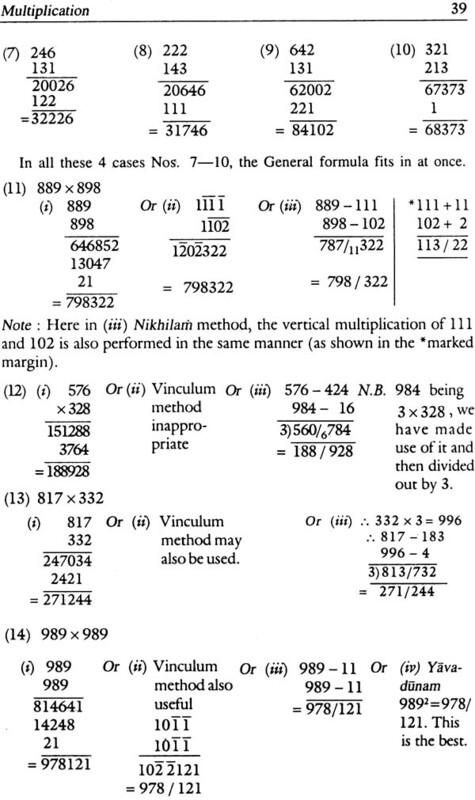 It deals mainly with various Vedic mathematical formulae and their applications for carrying out tedious and cumbersome arithmetical operations, and to a very large extent, executing them men- tally. In this field of mental arith- metical operations, the works of the famous mathematicians Trachten- berg and Lester Meyers (High Speed Maths) are elementary compared to that of Jagadguruji. Some people may find it difficult, at first reading to understand the arithmetical operations although they have been explained very lucidly by Jagadguruji. It is not because the explanations are lacking in any manner but because the methods are totally unconventional. Some people are so deeply rooted in the conven- tional methods that they, probably subconsciously, reject to see the logic in unconventional methods. HIS HOLINESS JAGADGURU SANKARACARYA SRI BHARATI KRSNA TIRTHAJI MAHARAJA (March 1884-February 1960)" was named as Venkatraman in his early days. As he was extraordinarily proficient in Sanskrit and oratory, he was awarded the title of 'Saraswati' by the Madras Sanskrit Association inJuly 1899. After winning the highest place in the B.A. Examination, he appeared at the M.A. Examination of the American College of Sciences, Roch- ester, New York from Bombay Centre in 1904 and passed in six subjects (Sanskrit, Philosophy, English, Mathe- matics, History and Science) simultan- eously securing the highest honours in all. In 1908, he proceeded to the Sringeri Matha in Mysore to learn at the feet of the renowned late Jagadguru Shankaracharya Maharaj Sri Satcidanandaji. After several years of the most advanced studies, the deepest meditation, and the highest spiritual attainment; he was initiated into the holy order of Sannyasa at Banaras (Varanasi) by Shankaracharya Sri Trivikram Tirthaji of Sharadapeeth on July 4th 1919 and on this occasion he was given the new name, Swami Bharati Krsna Tirthaji. Later, in 1925 Jagadguru Sankaracarya Sri Madhu- sudan Tirthaji of Govardhan Matha, Puri, virtually forced him to accept the Govardhan Math's Gaddi. In this capacity he continued to. disseminate the holy spiritual teachings of Sanatana Dharma in their pristine purity all over the world for the rest of his life. 1. In the course of our discourses on manifold and multifarious subjects (spiritual, metaphysical, philosophical, psychic, psychological, ethical, educational, scientific, mathematical, historical, political, economic, social etc., from time to time and from place to place during the last five decades and more, we have been repeatedly pointing out that the Vedas (the most ancient Indian scriptures, nay, the oldest "Religious" scriptures of the whole world) claim to deal with all branches of learning (spiritual and temporal) and to give the earnest seeker after knowledge "ail the requisite instructions and guidance in full detail and on scientifically- nay, mathematically-accurate lines in them all and so on. 2. 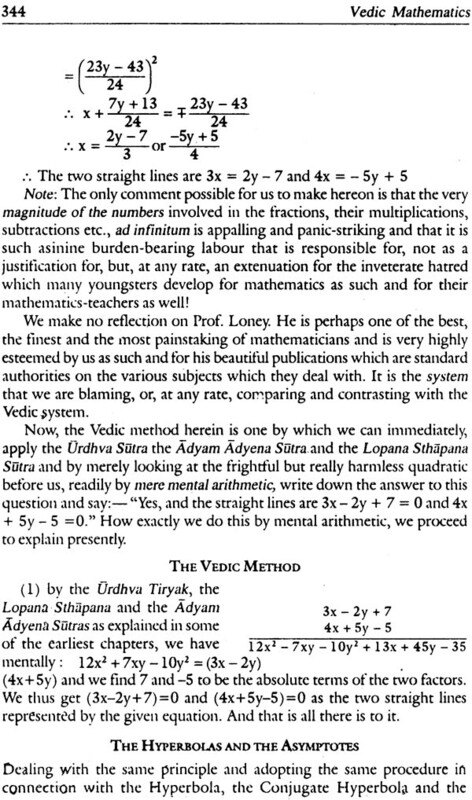 The very word "Veda" has this derivational meaning, i.e. the fountain-head and illimitable store-house of all knowledge. This derivation, in effect, means, connotes and implies that the Vedas should contain within themselves all the knowledge needed by mankind relating not only to the so-called 'spiritual' (or other-worldly) matters but also to those usually described as purely "secular", "temporal", or "wordly"; and also to the means required .by humanity as such for the achievement of all-round, complete and perfect success in all conceivable directions and that there can be no adjectival or restrictive epithet calculated (or tending) to limit that knowledge down in any sphere, any direction or any respect whatsoever. 3. In other words, it connotes and implies that our ancient Indian Vedic lore should be all-round, complete and perfect and able to throw the fullest necessary light on all matters which any aspiring seeker after knowledge can possibly seek to be enlightened on. 4. It is thus in the fitness of things that the Vedas include (i) Ayurveda (anatomy, physiology, hygiene, sanitary science, medical science, surgery etc.) not for the purpose of achieving perfect health and strength in the after-death future but in order to attain them here and now in our present physical bodies; (ii) Dhanurveda (archery and other military sciences) not for fighting with one another after our transportation to heaven but in order to quell and subdue all invaders from abroad and all insurgents from within; (iii) Gandharva Veda (the science and art of music); and (iv) Sthapatya Veda (engineering, architecture etc., and all branches of mathematics in general). All these subjects, be it noted, are inherent parts of the Vedas, i.e. are reckoned as "spiritual" studies and catered for as such therein. 5. Similar is the case with regard to the Vedangas (i.e. grammar, prosody, astronomy, lexicography etc..) which, according' to the Indian cultural conceptions, are also inherent parts and subjects of Vedic (i.e. Religious) study. 6. 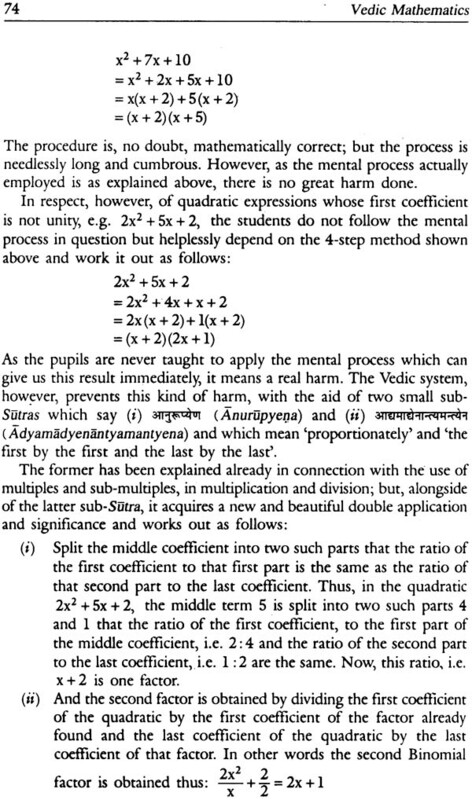 As a direct and unshirkable consequence of this analytical and grammatical study of the real connotation and full implications of the word "Veda" and owing to various other historical causes of a personal character (into details of which we need not now enter), we have been from our very early childhood, most earnestly and actively striving to study the Vedas critically from this stand-point and to realise and prove to ourselves (and to others) the correctness (or otherwise) of the- derivative meaning in question. 8. And the contemptuous or, at best patronising attitude adopted by some so-called Orientalists, Indologists, antiquarians, research-scholars etc., who condemned, or light hearredly, nay irresponsibly, frivolously and flippantly dismissed, several abstruse-looking and recondite parts of the Vedas as "sheer-non-sense'v=or as "infant-humanity's prattle", and so on, merely added fuel to the fire (so to speak) and further confirmed and strengthened our resolute determination to unravel the too-long hidden mysteries of philosophy and science contained in ancient India's Vedic lore, with the consequence that, after eight years of concentrated contemplation in forest-solitude, we were at long last able to recover the long lost keys which alone could unlock the portals thereof. 9. And we were agreeably astonished and intensely gratified to find that exceedingly tough mathematical problems (which the mathematically most advanced present day Western scientific world had spent huge lots of. time, energy and money on and which even now it solves with the utmost difficulty and after vast labour involving large numbers of difficult, tedious and cumbersome "steps" of workirig) can be easily and readily solved with the help of these ultra-easy Vedic Sutras (or mathematical aphorisms) contained in the Parisista (the Appendix-portion) of the Atharvaveda in a few simple steps and by methods which can be conscientiously described as mere "mental arithmetic". 10. Ever since (i.e. since several decades ago), we have been carrying on an incessant and strenuous campaign for the India-wide diffusion of all this scientific knowledge, by means of lectures, blackboard- demonstrations, regular classes and so on: in schools, colleges, universities etc., allover the country and have been astounding our audiences everywhere with the wonders and marvels not to .say, miracles of Indian Vedic mathematics. 11. We were thus able to succeed in attracting the more-than-passing attention of the authorities of several Indian universities to this subject. And, in 1952, the Nagpur University not merely had a few lectures and blackboard-demonstrations given but also arranged for our holding regualr classes in Vedic mathematics (in the University's Convocation Hall) for the benefit of all in general and especially of the University and college professors of mathematics, physics etc. 12. And, consequently, the educationists and the cream of the English educated section of the people including the highest officials (e.g. high- court judges, ministers etc.,) and the general public as such were all highly impressed nay, thrilled, wonder-struck and flabbergasted! And not only the newspapers but even the University's official reports described the tremendous sensation caused thereby, in superlatively eulogistic terms; and the papers began to refer to us as "the Octogenarian Jagadguru Sankaracarya who had taken Nagpur by storm with his Vedic mathematics"; and so on ! 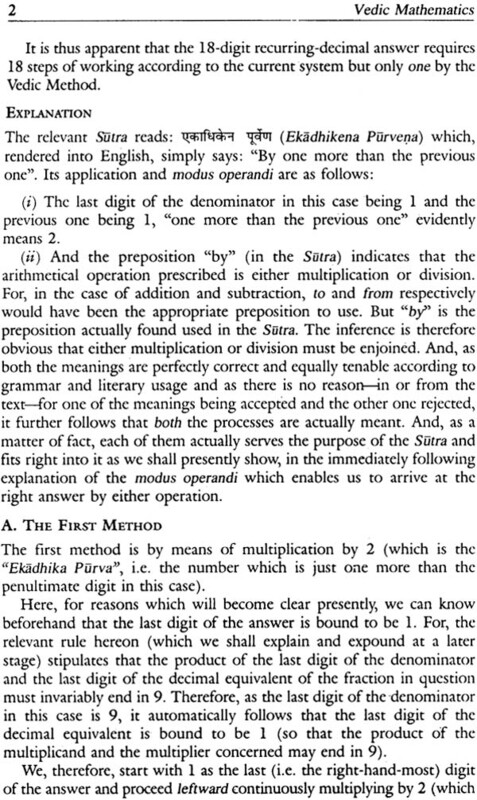 (i) The Sutras (aphorisms) apply to and cover each and every part of each and every chapter of each and every branch of mathematics (including arithmetic, algebra, geometry-plane and solid, 'trigonometry -plane and spherical, conics-geometrical and analytical, astronomy, calculus-differential and integral etc.). In fact, there is no part of mathematics, pure or applied, which is beyond their jurisdiction; (ii) The Sutras are easy to understand, easy to apply and easy to remember; and the whole work can be truthfully summarised in one word "mental" ! (iv) And, in some very important and striking cases, sums requiring 30,50,100 oreven more numerous.and cumbersome "steps" of working (according to the current Western methods) can be answered in a single and simple step of work by the Vedic method! 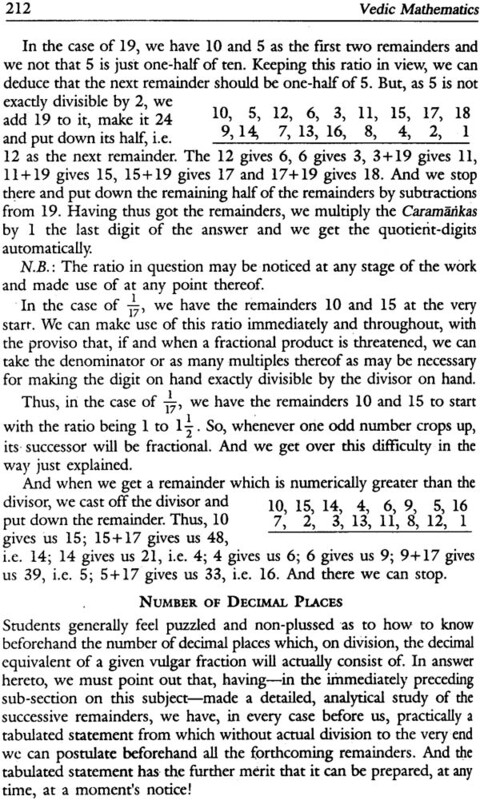 And children of even 10 or 12 years of age merely look at the sums written on the blackboard (on the platform) and immediately shout out and dictate the answers from the body of the convocation hall (or other venue of the demonstration). 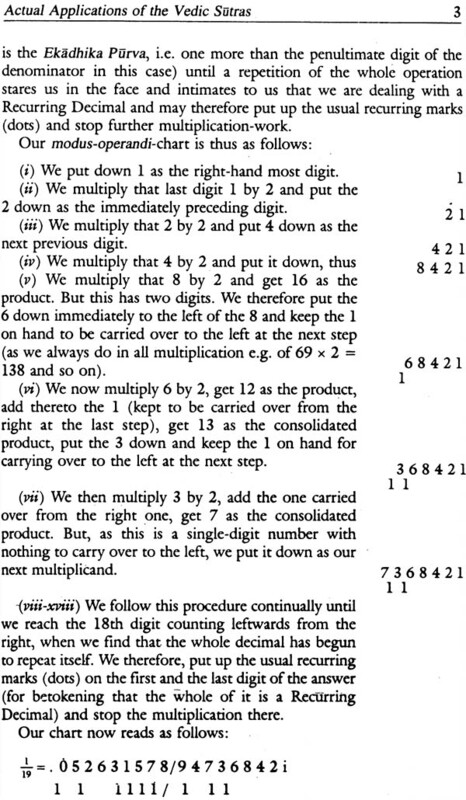 And this is because, as a matter of fact, each digit automatically yields. its predecessor and its successor! 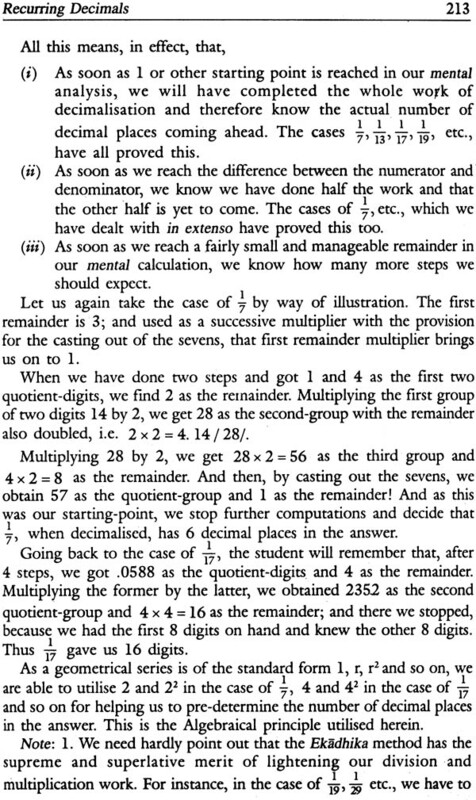 and the children have merely to go on tossing off (or reeling off) the digits one after another (forwards or backwards)by mere mental arithmetic (without needing pen or pencil, paper or slate etc.)! 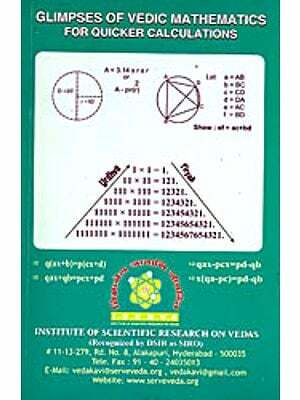 Vedic mathematics by the late Sankaracarya (Bharati Krsna Tirtha) of Govardhana Pitha is a monumental work. 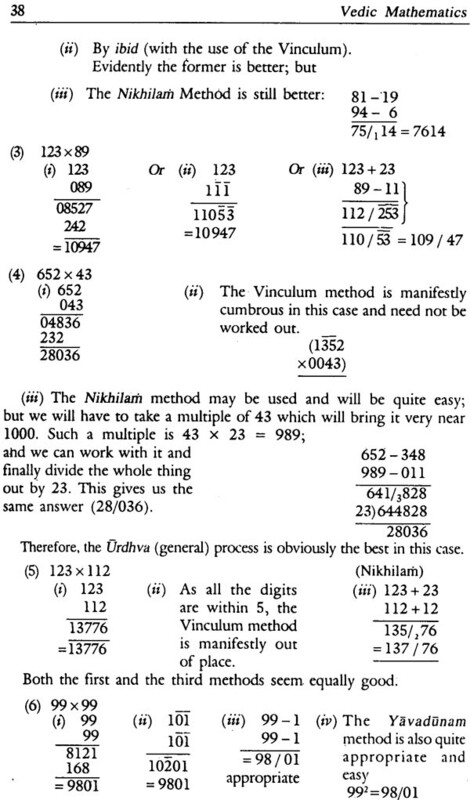 In his deep layer explorations of Cryptic Vedic Mysteries relating specially to their calculus of Shorthand formulae and their near and ready application to practical problems the late Sankaracarya shows the rare combination of the probing insight and revealing intuition of a Yogi with the analytic acumen and synthetic talent of a mathematician. With the late Sankaracarya we belong to a race now fast becoming extinct of die-hard believers who think that the Vedas represent an inechaustiable mine of profound wisdom in matters both spiritual and temporal and that this store of wisdom was not as regards its assets of fundamental validity and value at least gathered by the laborious inductive and deductive methods of ordinary systematic enquiry but was a direct gift of revelation to seers and sages who in their higher reaches of Yogic realization were competent to receive it from a source perfect and immaculate. But we admit and the late Sankaracarya has also practically admitted that one cannot expect to convert or revert criticism much less carry conviction by merely asserting one’s staunchest beliefs. To meet these ends one must be prepared to go the whole length of testing and verification by accepted accredited methods. 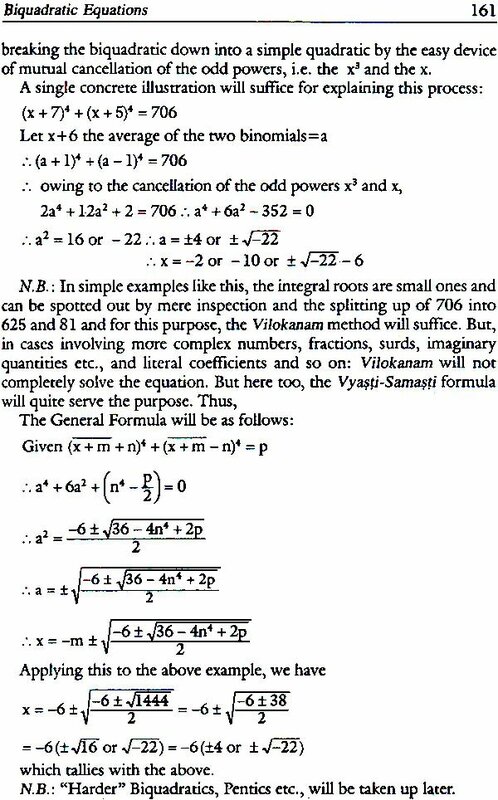 The late Sankaracarya has by his comparative and critical study of Vedic mathematics made this essential requirement in Vedic studies abundantly clear. So let us agree to gauge Vedic mysteries not as we gauge the far off nebulae with the poet’s eyes or with that of the seer but with the alert expert, scrutinizing eye of the physical astronomer if we may put it as that. 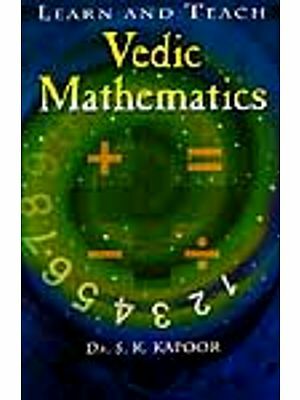 That there is a consolidated metaphysical background in the Vedas of the Objective sciences including mathematics as regards that basic conceptions is a point that may be granted by a thinker who has looked broadly and deeply into both the realms. In our paper recently published the Metaphysics of physics we attempted to look into the mysteries of creative emergence as contained in the well known cosmogonic Hymns with a view to unveiling the metaphysical background where both ancient wisdom and modern physics may meet on a common basis of logical understanding, and compare notes, discovering, where possible, points of significant or suggestive parallelism between the two sets of concepts, ancient and modern. That metaphysical background includes mathematics also; because physics as ever pursued is the application of mathematics to given or specified space-time-event situations. There we examined tapas as a fundamental creative formula whereby the Absolute emerges into the realms of measures, variations, limits, frameworks and relations. And this descent follows a logical order which seems to lend itself, within a framework of conditions and specifications, to mathematical analysis. Ratri in the Hymn represents the Principle of Limits, for example, rtanca satyanca stand for Becoming (calana-kalana) and Being (vartana-kalana) at a stage where limits or conditions or conventions do not yet arise or apply. The former gives the unconditioned, unrestricted how or thus of cosmic process, the latter, what or that of existence. Tapas, which corresponds to Ardhamatra in Tantric symbolism, negotiates, in its role specially of critical variation, between what is, ab initio, unconditioned and unrestricted, and what appears otherwise, as for instance, in our own universe of logico-mathematical appreciation. This is, necessarily, abstruse metaphysics, but it is, nevertheless, the starting background of both physics and mathematics. But for all practical purposes we must come down from mystic nebulae to the terra firma of our actual apprehension and appreciation. That is to say, we must descend to our own pragmatic levels of time-space-event situations. Here we face actual problems, and one must meet and deal with these squarely without evasion or mystification. The late Sankaracarya has done this masterly feat with an adroitness that compels admiration. It follows from the fundamental premises that the universe we live in must have a basic mathematical structure, and consequently, to know a fact or obtain a result herein, to any required degree of precision, one must obey the rule of mathematical measures and relations. This, however, one may do consciously or semi-consciously, systematically or haphazardly Even some species of lower animals are by instinct gifted mathematicians; for example, the migratory bird which flies thousands of miles off from its nest and after a period, unerringly returns. 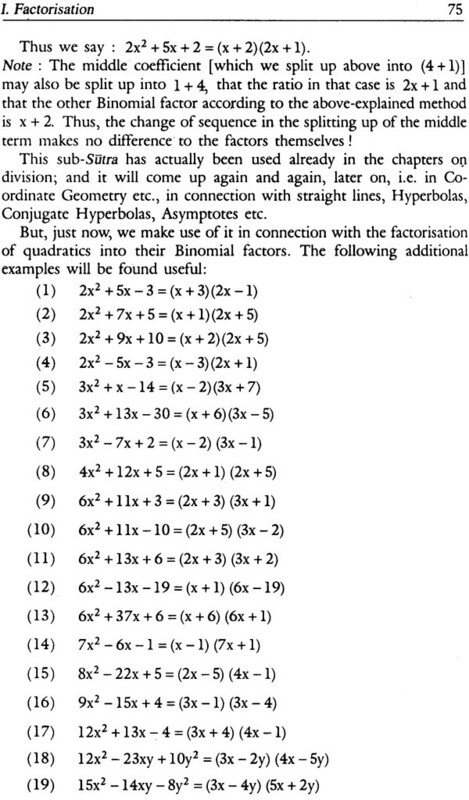 This implies a subconscious mathematical talent that works wonders. 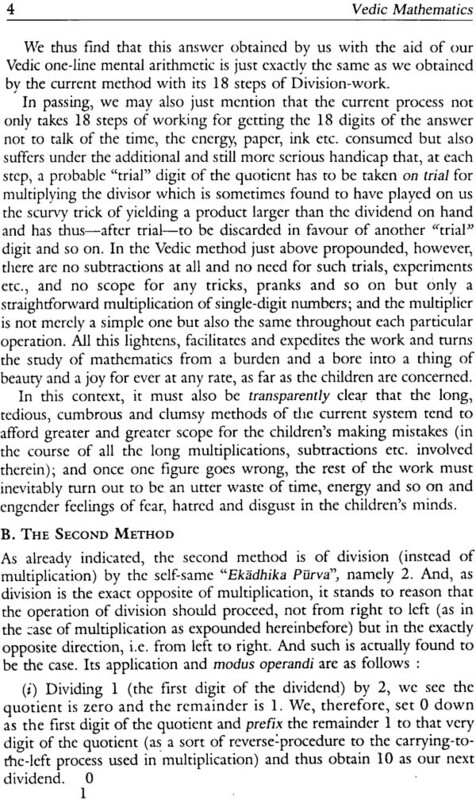 We may cite the case of a horse who was a mathematical prodigy and could ‘tell’ the result of a cube root (requiring 32 operations, according to M. Materlink in his ‘Unknown Quest’) in a twinkle of the eye. This sounds like magic, but it is undeniable that the feat of mathematics does sometimes assume a magical look. Man, undoubtedly, has been given his share of this magical gift. And he can improve upon it by practice and discipline, by Yoga and allied methods. This is also undeniable. Latel34 he has devised the ‘automatic brain’ for complicated calculations of science that look like magic. 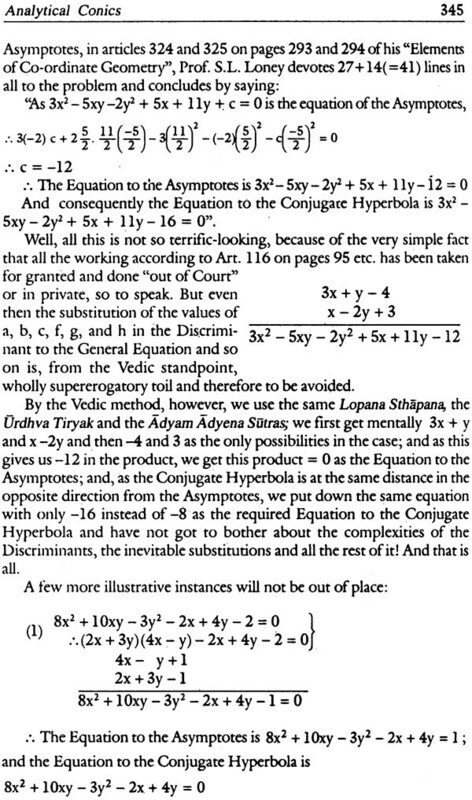 But apart from this ‘magic’, there is and has been, the ‘logic’ of mathematics also. Man works from instinct, talent, or even genius. Rut ordinarily he works as a logical entity requiring specified data or premises to start from, and more or less elaborate steps of reasoning to arrive at a conclusion. This is his normal process of induction and deduction. 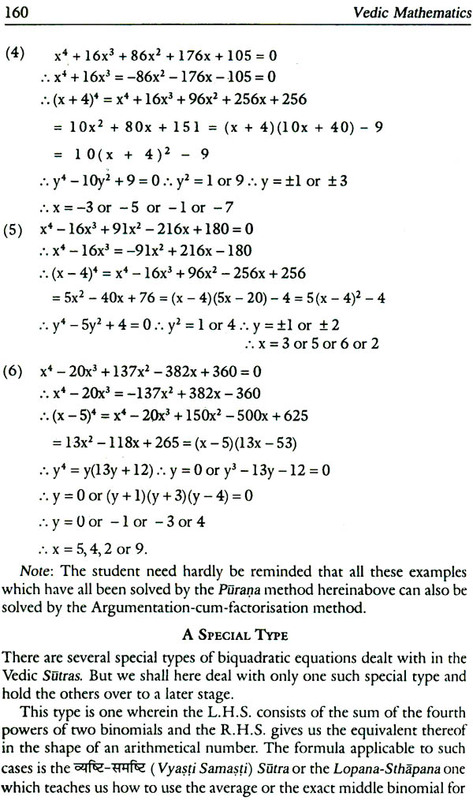 Here formulae (Sutras) and relations (e.g. 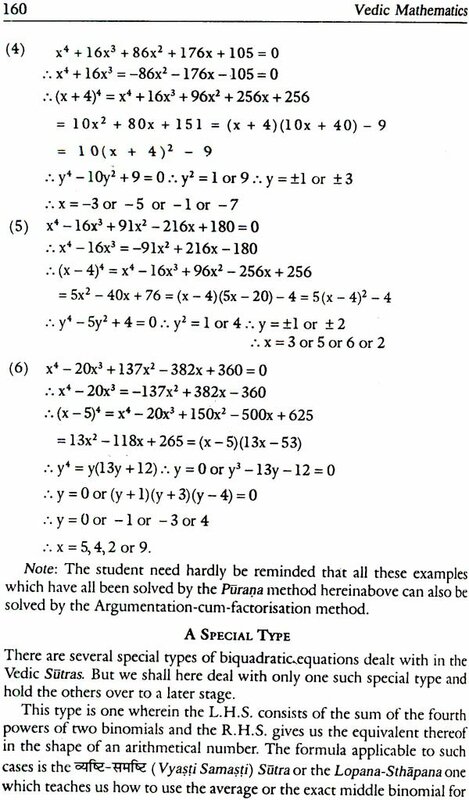 equations) must obtain as in mathematics. The magic and logic of mathematics in some cases get mixed up; but it is sane to keep them apart. You can get a result by magic, but when you are called upon to prove it, you must have recourse to logic. The late Sankaracarya has claimed, and rightly we may think, that the Vedic Sutras and their applications possess these virtues to a degree of eminence that cannot be challenged. The outstanding merit of his work lies in his actual proving of this contention. Whether or not the Vedas be believed as repositories of perfect wisdom, it is unquestionable that the Vedic race lived not as merely pastoral folk possessing a half-or-quarter-developed culture and civilization. The Vedic seers were, again, not mere ‘navel.gazers’ or ‘nose.tip-gazers’. They proved themselves adepts in all levels and branches of knowledge, theoretical and practical. For example, they had their varied objective both pure and applied. Let us take a concrete illustration. Suppose in a time of drought we require rains by artificial means. The modern scientist has his theory and art (or technique) for producing the result. The old seer scientist had his both also, but different from these now availing. He had his science and technique, called Yajna, in which Mantra Yantra and other factors must co-operate with mathematical determinateness and precision. For this purpose, he had developed the six auxiliaries of the Vedas in each of which mathematical skill and adroitness, occult or otherwise, play the decisive role. The Sutras lay down the shortest and surest lines. The correct intonation of the Mantra, the correct configuration of the Yantra (in the making of the Vedic etc., e.g. the quadrature of a circle) the correct time or astral conjugation factor the correct rhythms etc, all had to be perfected so as to produce the desired result effectively and adequately. 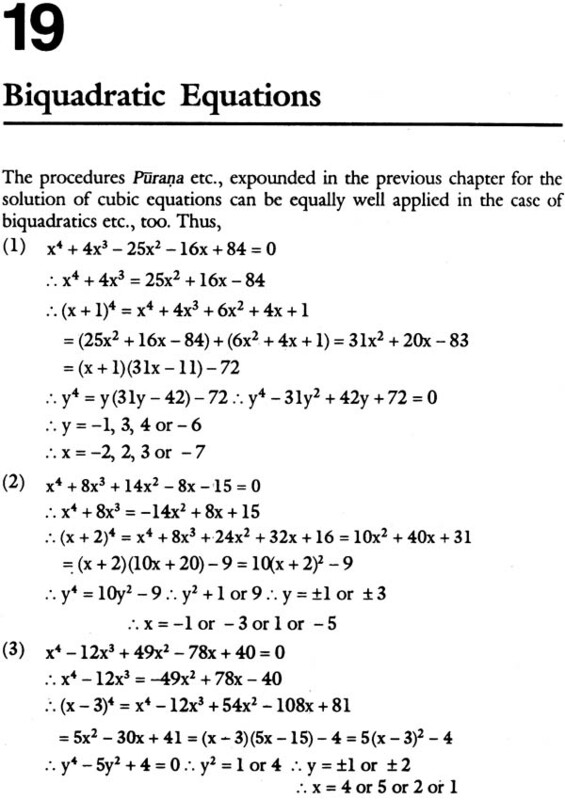 Each of these required the calculus of mathematics. The modern technician has his logarithmic tables and Mechanics manuals the old Yajnika had his Sutras. How were the Sutras obtained by magic or logic or both is a vital matter we do not discuss here. The late Sankaracarya has claimed for them cogency compactness and simplicity. This is an even more vital point and we think he has reasonably made it good.